I've been making sure my gamer friends are aware of a kind of duplicitous item pack DDO has for sale. They don't outright lie about it, but lie by implication and omission. The item is the "Dungeons & Dragons Online™: Starter Pack - Digital Download". First the implication. 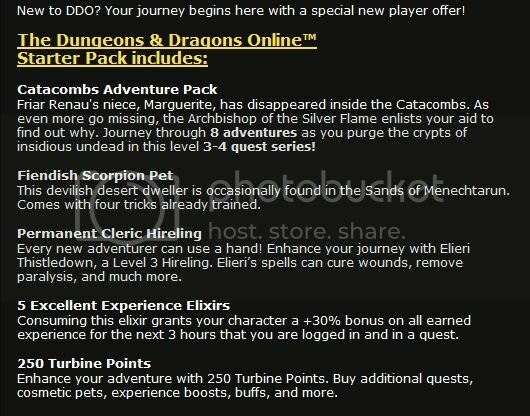 To date the only "pet pack" DDO has sold directly was the one that came with the Underdark pre-order. Everything on the pre-order was per character. Which makes sense. They are digital items so there is nothing to produce after it is made. The other implication you can see above: "Permanent Cleric Hireling - Every new adventurer can use a hand! Enhance your journey with Elieri Thistledown, a Level 3 Hireling." With how they've been handled to this point and that wording many would think that this item is collectable on a per character basis. That is where the omission comes in the fact that this is one per account. You don't get one per character. While the Cleric(and xp potions) is Account bound and can be passed around the scorpion is not. And if you don't want to have to keep track of who has your Level 3 Cleric each time that means you would have to pay 20/30/80+ dollars depending on how many characters you have. Not once in the purchasing are you warned about this fact. They know to many this starter pack isn't worth the $10 dollars that they are trying get you for. Especially for a digital item that costs them nothing to produce. However rather than informing people they want to catch those that would be willing for one that gave on a per character basis. It is extremely underhand when coupled with the fact that many people have been telling them this on the forums and yet they still do nothing to warn others. So far everyone that I know who is playing is passing on the item once they know it is basically $10 per character. I hope this post helps others before they make the same mistake I did.